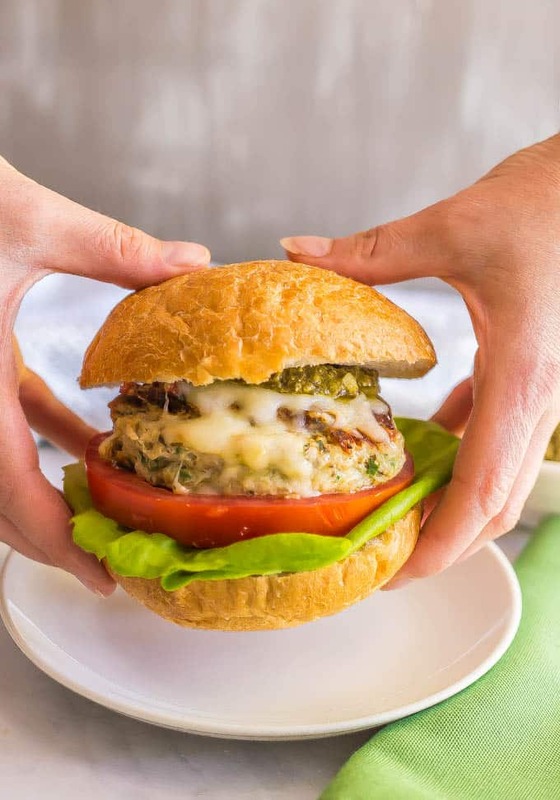 Chicken spinach burgers have just 5 ingredients and are full of cheesy shredded mozzarella, chopped fresh spinach and rich flavor from a touch of pesto. 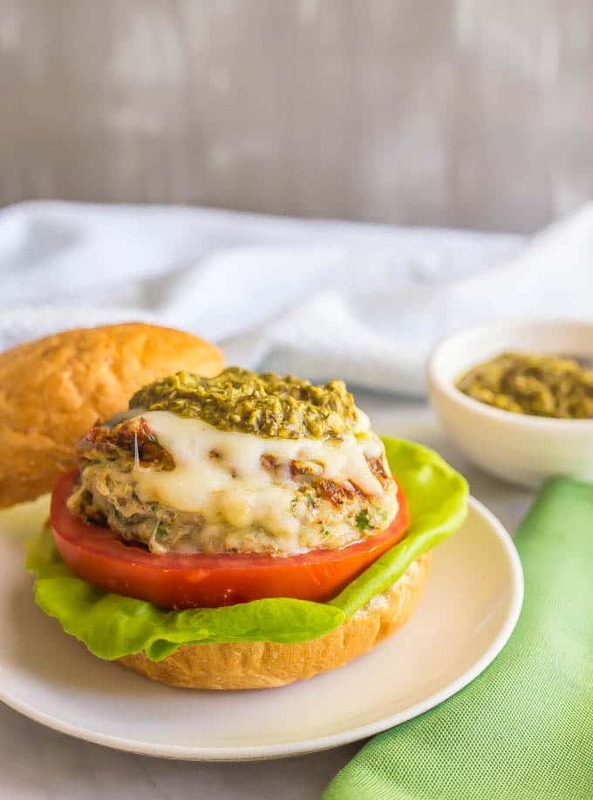 Top with extra mozzarella and pesto and serve on buns or in a lettuce wrap for a delicious, healthy burger! Both kids finished up school this past week (M is done with first grade and J finished 4-year-old preschool… he goes to TK in the fall) and a long, luxurious summer is stretched before us! I, however, don’t get a summer break from my job, so we’ve got help in the form of an amazing nanny (one of their former preschool teachers) in the mornings. And I’m really hoping to cut back a little on some of the extra work and have some good quality time with the kids in the afternoons. Goals, right?! OK, OK, food though, right?! 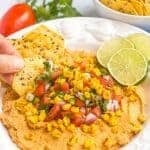 Last month I brought you my fiesta turkey burgers, which are seasoned with taco seasoning and piled up with all your favorite taco toppings. All the yum! And you know I love my BBQ chicken burgers, cheddar chicken burgers and zucchini turkey burgers. We’re kind-of burger people around here. Especially come summertime. 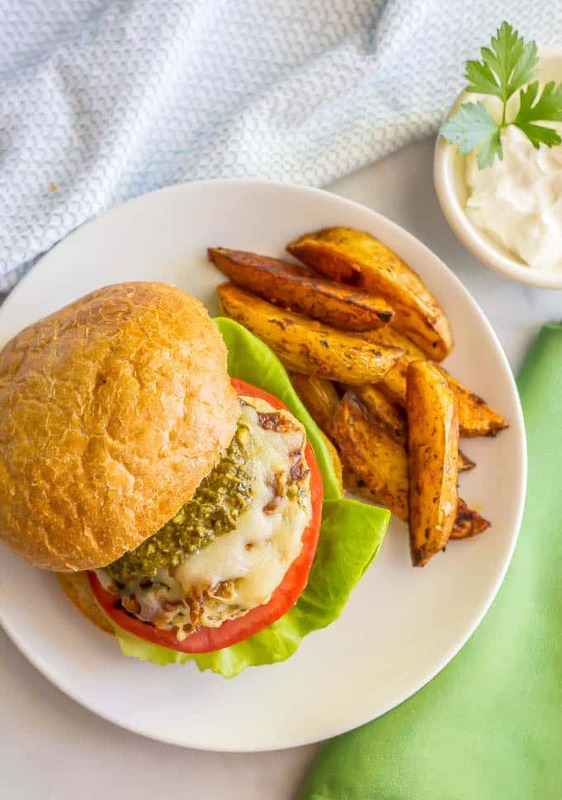 So today I’m sharing with you my chicken spinach burgers, which are full of chopped spinach, shredded mozzarella cheese and a little bit of pesto to give them a hint of richness and depth. 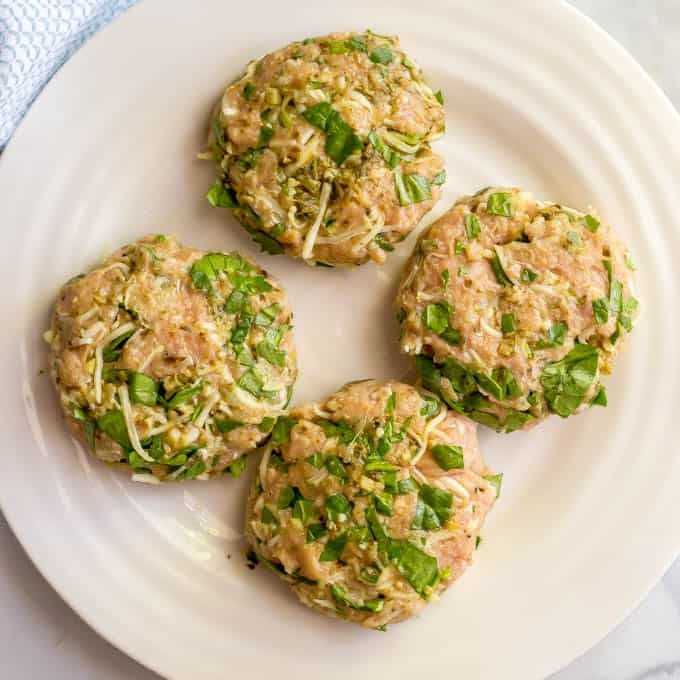 Ground chicken burgers can have a tendency to dry out, so I’m always loading mine up with add-ins to keep them super flavorful. 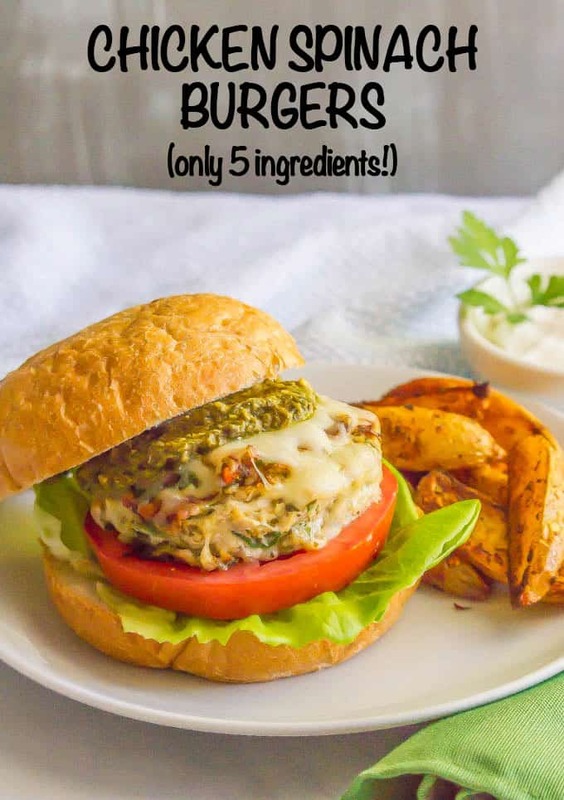 These healthy burgers are also just 5 ingredients and you can make them in a skillet inside or out on the grill. Choose your own adventure! I use lean ground chicken that’s usually labeled between 90% and 93% lean. The super lean kind (99% lean) doesn’t have very much flavor in my opinion. 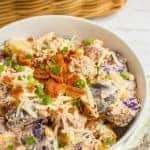 You can also make your own ground chicken. 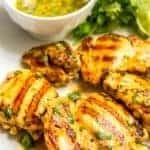 Cut a pound of raw chicken breasts into smaller pieces and place them in a food processor. Pulse and process until the chicken breasts are broken down. 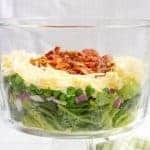 You could also add some extra Italian flavor with some sun-dried tomatoes and/or fresh basil as toppings for your burger. I usually make our burgers in a pan on the stove, but you could certainly cook these on a grill if you prefer. 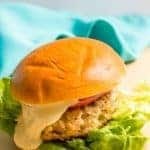 You can serve these burgers in a regular bun or make a lettuce wrap if you want to be low-carb (and/or gluten-free). And here’s my VIDEO to show you how easy these are to make! 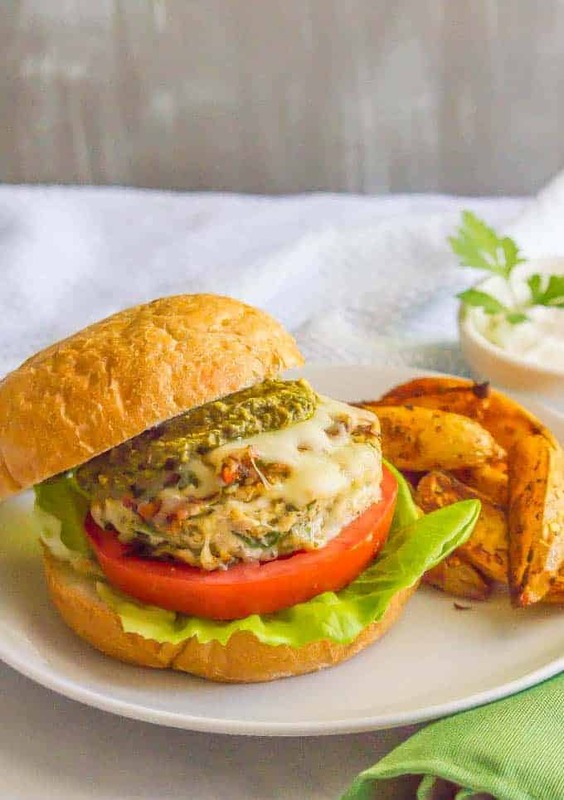 Chicken spinach burgers have just 5 ingredients and are super juicy and flavorful! Add ground chicken, chopped spinach, mozzarella cheese, pesto, garlic, salt and black pepper to a medium bowl. Using a fork and then your hands, mix until just combined. Divide mixture into 4 equal parts and form burger patties that are about 1/2 inch thick. Heat a large non-stick pan over medium-high heat and add canola oil. Add burgers to pan and cook over medium-high heat for 5-6 minutes, then flip and continue cooking until done, about 5-6 minutes more. Keep an eye on your temperature and reduce the heat if they are starting to burn. If you are adding sliced cheese to your burgers, you can do that when you flip them, so it melts as they finish cooking. Let rest for a few minutes before serving. Then add desired toppings and enjoy! 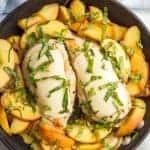 I highly recommend serving these with extra mozzarella melted on top and a dollop of pesto to reinforce those flavors. Pesto is in the recipe?! Sign me up! You can’t go wrong with pesto!! That pesto looks delicious! I like how you snuck some spinach in too!